BSF offers a variety of programs, from ages 5+ in Nordic (cross country) skiing, including learn-to-ski programs, for youth and adults as well elite professional skiers. Everyone is welcome. (We also groom an amazing network of trails in Bozeman.) COME SKI WITH US. Ages 10+ are invited to try out BSF's summer dryland program with BSF Nordic. No ski experience necessary! Explore Bozeman's best trails all summer long. Seventeen BSF Nordic athletes have been named to regional teams to compete at Junior Nationals in Anchorage, Alaska. Meet Heidi Makoutz, our Coach of the Month. A BSF coach since 2008, she brings a unique enthusiasm to Bozeman's adult skiing community. Prices for the Nordic Introductory programs will increase by $50 on Saturday, November 17. 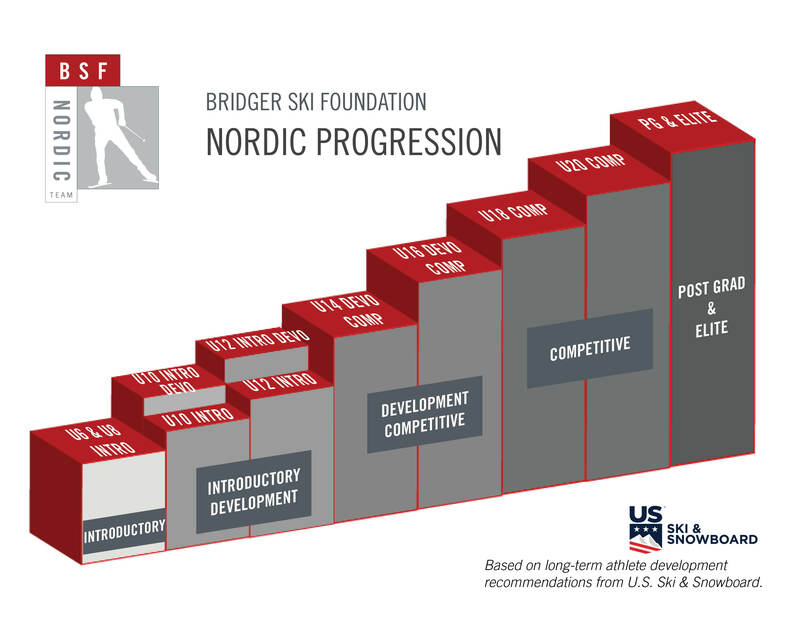 BSF uses an U-age system to allow skiers to progress through the program. The U6 & U8 Introductory program (formerly YSL) offers beginning xc ski instruction for the youngest Nordic skiers (age 5-7) interested in Tuesday, Thursday and/or Saturday sessions for eight weeks starting mid-January. Skiers ages 8-11 may participate in the U10 & U12 Introductory and Introductory Development (Intro Devo) programs. Choose a program based on age, skill, and length of program. Then move up when you're ready. We work on skate and classic techniques, play games, and have fun. No prerequisite skills. The U14 & U16 Development Comp (Devo Comp) team gives skiers ages 12-15 a great team atmosphere to explore the mountains and develop their skiing and team-building skills. Includes dryland training. The U18 & U20 Competitive Team is for the older skier dedicated to the sport of Nordic skiing. Options for summer-only or year-round training. The P-G Team is designed for local high school post-graduates, out-of-town post-grads (possibly taking classes at MSU), or MSU student athletes who do not make the MSU Team. The goal is to develop and maximize each skier’s potential. The Elite Team is available for competitive skiers at the highest levels in sport, competing at the Junior and Senior levels. Year-round training and racing programs available, with varying levels of support. Application process to join. The BSF Masters Community offers adult skiers a number of training, clinic, and social options in both the fall and winter. Open to adults of all ages and abilities interested in improving their ski technique and fitness, meeting friends, and having fun on the snow. Options for learning how to skate ski, regular ski training sessions, fall dryland sessions, private lessons, and more. There’s a bigger picture to what BSF teaches skiers, when and why. BSF’s programs and the progression are consistent with the USSA Long-Term Athlete Development (LTAD) Systems. This makes it easy for your child to progress through our programs—from Youth Ski League, the Development Teams, to the competitive teams, and even on to skiing as an adult Masters athlete. That being said, this is the "ideal" progression. Skiers are welcome to join BSF programs at any stage, and there are plenty of BSF alumni who started skiing "late" and not only enjoyed the teams but went on to successful skiing careers. "What should a Nordic skier do? And when should they do it?" Ski 1-3 days a week. Emphasis on outdoor recreation. Ski for play, fun and balance. Parents encourage play versus training. Participate in many physical activities. Explore individual coordination or balance-based sports. Team sports to build teamwork, ethics and fair play. Begin to develop fundamental movement skills through play, fun, novel activities. Ski 2-6 days a week, or as enjoyable. Emphasis on outdoor recreation. Parents emphasize activity versus training. Play many sports. Active participation in coordination- or balance-based sports. Participate in team sports to build teamwork, ethics and fair play. Increase play to enhance specific elements of physical fitness in open environments. 2-4 training sessions per week, year-round in addition to other sports and outdoor activities. Emphasis on outdoor recreation and an introduction to fun competition. Continue to participate in many activities and sports. Begin to identify with primary vs. complementary sports. Start to incorporate focused dryland training 1-2 days per week. Enhance body awareness, balance, and spatial anticipation through games and drills. 3-5 training sessions per week in season, 2-4 training sessions per week out of season. Emphasize fun training. Continue to participate in complementary sports while identifying clear goals in primary sport. Physical fitness is becoming an integral part of the season. Increase hours of training with varied volumes and intensity. 5-7 training sessions per week in season, includes some two-a-day sessions, 4-6 training sessions per week out of season. Use complementary sports and activities for variety and to enhance aerobic conditioning by increasing training volume in all activities. Implement periodized training with varying volumes and intensity. Training is now essential to seasonal programming with 2-3 sessions per week and off-season fitness plans. Use complementary sports and activities for injury prevention, avoiding burnout, and to maintain all aspects of physical fitness. Year-round, periodized training plans with varying volumes and intensity are essential to prepare for full competition and training loads. For more detailed information regarding athlete plans and development, please visit the individual age group pages on the Nordic page.